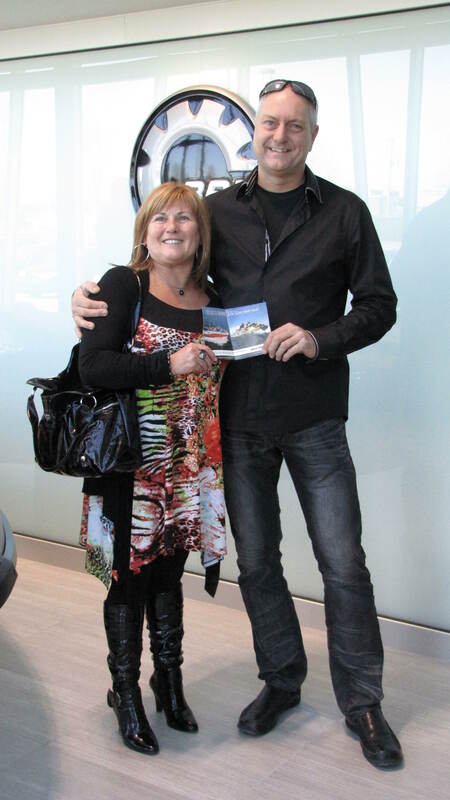 A lucky couple from Québec wins their BRP Dream Garage! When Michel Rocheleau and Joan Bouret decided to go to the Quebec City Boat Show on March 24, they had no idea of ​​the surprise that awaited them. It was during this event that the couple visited the BRP booth and were both given a coupon for the “Win a Dream Garage” contest. One of these coupons contained the number that would allow the couple to win $50,000 of BRP products! 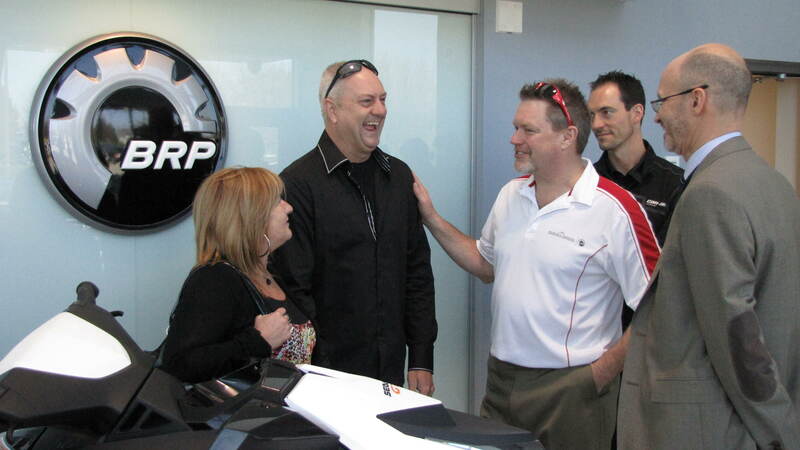 The BRP team invited them to their Valcourt offices to congratulate them. We took the opportunity to gather feedback on this memorable event. Did you go to the Quebec City boat show intending to buy or just browse? No, we wanted to look at different boats to make up our minds on a gift for Michel’s 50th birthday next year, so it was a good opportunity to start shopping. How did you react when you learned you were the grand winners of $50,000 from BRP? When Michel entered the coupon’s code on the contest website and we saw that the code was a winner, we first thought we had won a chance to win, we could not believe we had really won! We visited the website multiple times to answer our questions; it was definitely a sign of life. Do you know yet what will you get with this $50,000 offered by BRP? We would like to take the time to enjoy life with this incredible gift. Our choice is made and we will get a Sea-Doo 230 SP boat. It’s an amazing boat! Where will you use this new boat? On the St. Lawrence River around Québec City with family and many other lakes in the Eastern townships with friends. Michel was of course happy to receive this gift, but even more so that it comes from a company of his native region, the Eastern Townships. I’m glad to be here and to see a business from home that has become an international company. It’s a source of pride. The winners will go to their local dealership to take possession of their new boat they were able to purchase with the prize money. The “Win a Dream Garage ” contest allowed visitors to BRP kiosks at boat, motorcycle and ATV shows around North America have a chance to win $50,000 of BRP products. Congratulations again to the winners! Show off your Sea-Doo style with our 2012 Sea-Doo parts, accessories and riding gear. The 2012 style have hit the stores and BRP has a wide variety of items to choose from. Whether you are looking to outfit your Sea-Doo WAKE tower with a rocking sound system and booming speakers, adding a Speed Tie fully- integrated PWC mooring system to make docking easy and secure or adding a high-rise Retractable Ski Pylon with built-in spotter grab rails to your PWC to ensure WAKEboarder safety…we have something for everyone. The Sea-Doo LIFE also includes your personal Sea-Doo style and the 2012 Sea-Doo Sportswear offers the latest in watersports wear–Sea-Doo style. The guys will look fashionable out of the water and functional in the water in our Sea-Doo Technical Board Shorts made out of 4-way stretch, ultra light and quick-dry fabric. 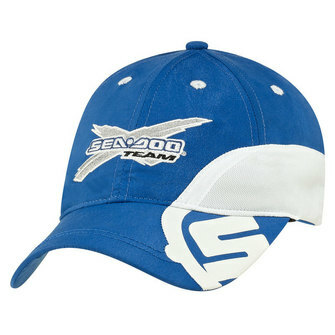 Get your X-Team Racing groove on while sporting our 2012 X-Team cap. These are available for a limited time, so get them before they are all gone! Not to leave out the ladies! 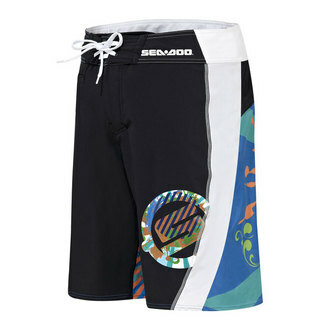 The 2012 Sea-Doo Ladies Technical Riding Boardshorts are made of the same comfortable 4-way stretch, ultra light and quick-dry fabric great for a comfortable day on the water. 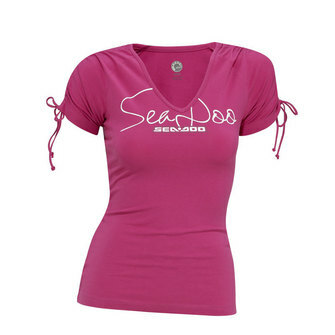 Our ladies Sea-Doo Signature Tee perfectly complements the Board shorts and makes for an fashionable day on the water, at the beach or anywhere else! For a limited time get free shipping on all order of $150 or more from the Sea-Doo online store. So, what are you waiting for? 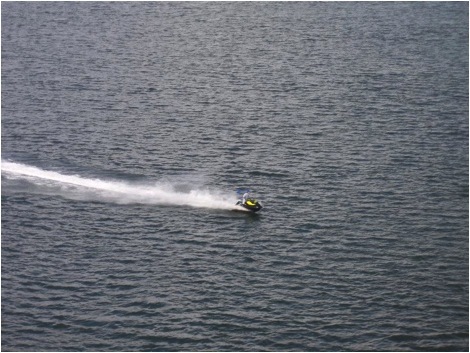 Get your Sea-Doo gear and get ready to get out on the water sporting your Sea-Doo style! BRP will be changing one lucky person’s life by awarding a new 2012 Sea-Doo GTX S 155 watercraft and a Sea-Doo MOVE iCatch PWC trailer in the “Share the Sea-Doo Life” Sweepstakes. The photo-based sweepstakes can be found on the Sea-Doo Facebook fan page and is being launched in connection with the start of the Sea-Doo Life Test Ride Tour. Every activity in the Share the Sea-Doo Life sweepstakes earns chances to win and contestants can earn up to 2012 entries. Enter the contest by visiting http://www.sharetheseadoolife.com. Participants will receive one entry into the contest by completing the entry form on Facebook, the microsite, or mobile device. To increase chances of winning, participants must log onto the Sea-Doo Facebook, like the page, click on the contest application and enter up to four photos in the Sea-Doo Life photo contests then share them with your friends and family. 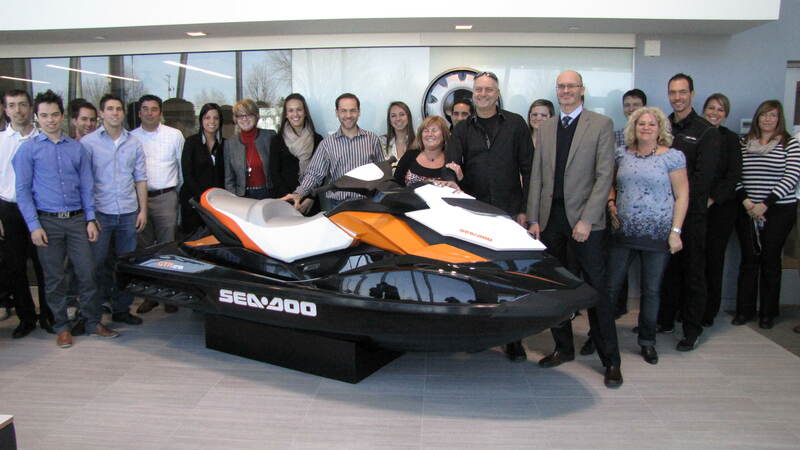 o Start your Sea-Doo Life: Contestants can visit their local Sea-Doo dealership and take a photo with their favorite Sea-Doo watercraft or boat, holding the Sea-Doo Life sign provided by the dealer. To locate a BRP dealer visit the Sea-Doo Dealer Locator. o Test Drive the Sea-Doo Life: The “Sea-Doo Life Test Ride Tour” is underway and includes 28 tour stops throughout the US. 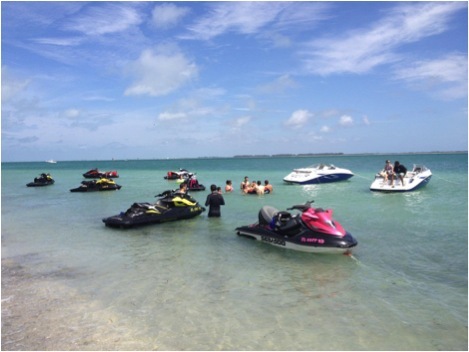 Participants can register and attend one of our test ride tour events to experience a Sea-Doo watercraft, with the world’s only on-water brake, or Sea-Doo boat. Contestants take a photo holding the Sea-Doo Life sign at the event. Participants register for, the “The Sea-Doo Life Test Ride Tour” visit http://www.seadoodemo.com. o Share Your Sea-Doo Life: Contestants are asked to upload a photo of themselves, with a minimum of two friends and/or family, enjoying the Sea-Doo Life on the water. o Showcase your New Sea-Doo Life: If a contestant purchases a new Sea-Doo during the contest, they can showcase their new Sea-Doo by uploading a photo of their new Sea-Doo. • Once the photos are uploaded, contestants are encouraged to share their photo with family and friends. Each ‘thumbs-up’ qualifies as an additional entry, with a maximum of 2012 contest entries possible. The more the pictures are shared the more chances the participant has to win. The Share the Sea-Doo Life Sweepstakes showcases the Sea-Doo lifestyle to friends and family of existing fans and brings awareness to BRP’s advanced technologies that make Sea-Doo the world leader in boating fun. For a look at the new 2012 Sea-Doo watercraft, boats, and related products visit www.sea-doo.com. BRP is proud to support the 2012 Pro Hydro-X tour. Come out and see where champions are made at the 2012 Sea-Doo Pro Hydro-X Tour. The tour kicks off May 5-6 in Tavares, Fla., and features multiple race sites across the southeastern U.S. Along with the exciting races, classes will be available for racers from beginners to Pro and includes free admission for spectators to most of the events. Closed Course Racing will be in the following cities: Tavares, Fla., Macon, Ga., Myrtle Beach, S.C. and Atlanta, Ga. The HydroDrag circuit and RIVA Racing HydroDrag Finals will be in Polk City, Fla, Atlanta, GA., and Sarasota or Naples, Fla.
Sea-Doo is the title sponsor for the 16th consecutive year for the tour and HydroTurf, Blowsion, Jettribe. RIVA Racing is the presenting sponsor this season. All competitions will be sanctioned by the International Jet Sports Boating Association (IJSBA) from Halfmoon Bay, Calif. and qualify for the Sea-Doo X-TEAM Bounty Program. BRP continues to lead the industry by supporting PWC racers with the Sea-Doo X-TEAM Bounty, the only racer contingency program in the sport, offering additional funds to racers finishing on the podium* aboard Sea-Doo watercraft. This “open sponsorship” is available to all modern* Sea-Doo watercraft racers rewarding them for top finishes and to help fund their racing efforts. The Racing season begins with a strong buzz about the new Sea-Doo RXP-X that turns tighter and connects the rider to the machine like no other model before it. On the heels of James Bushell winning both the PRO Open and PRO GP World Championships on the new T3 hull, expectations are high for X-TEAM riders. For 2012 many of the Sea-Doo X-TEAM Bounty payouts have been raised. For more information on the go to http://bit.ly/2012XteamBounty. For more information on the 2012 PRO HydroX Tour Events, visit www.prohydroxtour.com. Un couple chanceux du Québec gagne son Garage de Rêve BRP! Le 24 mars 2012, lorsque Michel Rocheleau et Joan Bouret ont décidé de se rendre au Salon Expert Chasse et Pêche et Salon du Bateau de Québec, ils n’avaient aucune idée de la surprise qui les attendait. C’est lors de cet événement que le couple a visité le kiosque BRP et s’est vu remettre un coupon de participation chacun pour le concours “Gagner un garage de rêve BRP”. Un de ces coupons contenait le numéro gagnant qui allait permettre au couple de gagner 50 000 $ de produits BRP ! L’équipe BRP les a reçus dans ses bureaux de Valcourt pour les féliciter. Nous en avons donc profité pour recueillir leurs commentaires sur cet événement mémorable. Étiez-vous allé au salon nautique de Québec dans l’intention d’acheter un nouveau bateau? Non, nous voulions nous faire une idée du type de bateau que nous voulions en vue de s’offrir un cadeau pour les 50 ans de Michel l’an prochain, alors c’était une bonne occasion pour commencer à regarder. Comment avez-vous réagit lorsque vous avez appris que vous étiez gagnants de 50 000 $ de produits BRP? Lorsque Michel a entré le code sur le site Web et que nous avons vu que le code était gagnant, nous avons d’abord pensé que nous avions gagné une chance de gagner, on ne pouvait pas croire que nous avions vraiment gagné. À répétition, plusieurs visites du site Web sont faites au cours desquelles nous avons trouvé la réponse à nos questions, c’est sûrement un signe de la vie. Savez-vous déjà ce que vous vous procurerez avec ce 50 000 $ offert par BRP? Nous désirons profiter un peu plus de la vie grâce à cet extraordinaire cadeau. Notre choix est fixé sur le bateau Sea-Doo SP-230..Il est tout simplement magnifique. Où utiliserez-vous ce nouveau bateau? Sur le fleuve Saint-Laurent, près de l’île d’Orléans avec la famille et sur plusieursautres lacs du Québec et de l’Estrie avec des amis. Michel était bien sûr heureux de recevoir ce cadeau, mais encore plus que cela provienne de BRP, une entreprise de sa région natale, l’Estrie. Je suis content d’être ici et de voir qu’une entreprise de chez nous est maintenant rendu internationale, c’est une source de fierté. Les gagnants pourront aller chez leur concessionnaire de la région de Québec afin de se procurer le bateau qu’ils désirent. Le concours “Gagner un garage de rêve BRP” était un concours qui permettait aux visiteurs des kiosques BRP des expositions de bateaux, de motos et véhicules tout-terrain de l’Amérique du Nord d’avoir la chance de gagner 50 000 $ de produits BRP. Félicitations encore aux gagnants!